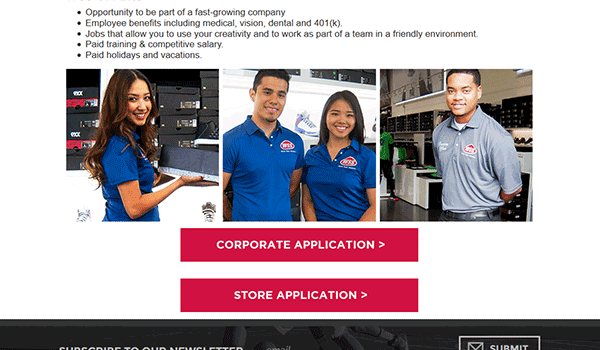 The WSS job application is available on the company’s careers website. Both in-store/retail and corporate positions can be applied for online. WSS (otherwise referred to as Warehouse Shoe Sale) is an American chain of shoe stores based out of Los Angeles, California. The company was founded in 1984 and currently has upwards of 70 locations throughout California (with limited locations in other states). Step 2 – Scroll down the page and then click the link of the type of application you want to complete (e.g. retail or corporate). Note: The remaining steps detail how to submit a retail application. Step 3 – Select a location from the drop-down list and then select the position(s) you are interested in. Do you have any relatives employed by the company? Step 6 – Submit the required details in order to finish the application process.